'Extraterrestrial Imperative' by Marsha Freeman spotlights the life of German rocket scientist Krafft Ehricke. This story was updated at 11:54 a.m. EDT. Space exploration has created whole new fields of science, and revolutionized our understanding of the Solar System and the universe. But before the Space Age had even begun, German-born space visionary Krafft Ehricke had given us the ?real reasons? for exploring space. He wrote in 1957: ?The idea of traveling to other celestial bodies reflects to the highest degree the independence and agility of the human mind. It lends ultimate dignity to man?s technical and scientific endeavors. Above all, it touches on the philosophy of his very existence.? This quote from Krafft Ehricke appears in the foreword to his biography ?Krafft Ehricke?s Extraterrestial Imperative? (Apogee Books, 2009). Krafft Ehricke had no doubt that mankind would develop the technical tools to explore space from his experience with the successes of the German rocket program during World War II. In the U.S., he designed and led the development of the world?s first liquid hydrogen upper stage, the Centaur, still in use today. He designed space stations, nuclear-powered spacecraft, cities in space and manmade, self-sufficient new planets to orbit the sun. In the 1960s, Krafft Ehricke explained how space could be used for therapeutic purposes, as well as for fun. In the early 1970s, he developed the concept of the extraterrestrial imperative to make clear that for mankind to continue to grow, we have no choice but space exploration. The ?closed world? of the Earth is finite and eventually, resources will run out, he concluded. But developing and exploiting extraterrestrial resources would remove any ?limits to growth,? a pessimistic concept that became popular in the 1970s. There are no ?natural? limits, Ehricke insisted, only those that mankind places on himself. Never a ?pie in the sky? dreamer, over the last decade of his life, Krafft Ehricke developed an exquisitely detailed study of the industrial development of the moon, which he described as Earth?s ?seventh continent,? in order to illustrate how the extraterrestrial imperative could in fact be realized. This multi-generational project is a comprehensive guide to moving human civilization in to space. At the present moment, when financial crises threaten to lower our sights, Krafft Ehricke would argue, as he did during the 1970s take-down of the infrastructure that the Apollo program had created, that it is precisely investment in the future that will return the nation to a path of prosperity. Trying to ?conserve? our way out of a crisis, he observed, will only accelerate the downward spiral of economic decline. As the book?s author, I had the good fortune to work with Krafft Ehricke for the last few years of his life, as well as the chance to draw on a selection of his articles, speeches and interviews to help bring his ideas to life in his own words. Marsha Freeman is an author living in Virginia. 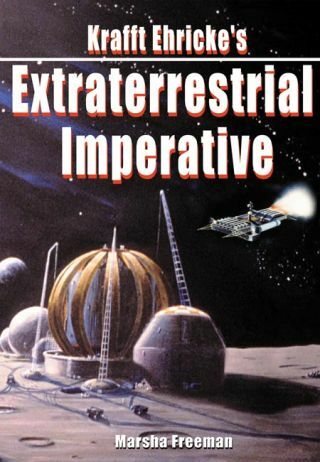 This account of "Krafft Ehricke?s Extraterrestrial Imperative," available here, was written for SPACE.com.